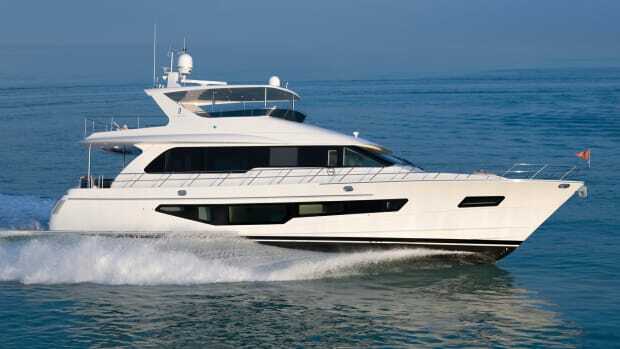 Seagoing comfort is the Belize 66 Sedan’s forte, in addition to her luxurious layout. 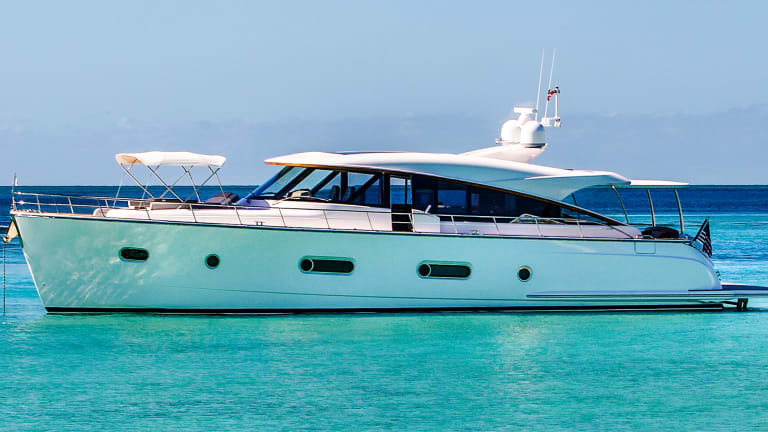 Once my test boat—Riviera’s new Belize 66 Sedan—was well beyond the Port Everglades jetties, the sea state settled into a succession of sun-washed 6-footers rolling in from the east, with whitecaps pretty much everywhere. It was just the sort of weather the Aussies on board were totally cool with, it seemed, based on my experiences over the years sea-trialing boats down in Sydney, Adelaide and other Australian coastal cities. Nothing comes close to topping the infamous Southern Ocean for sporty weather in my opinion. And as for the Tasman Sea, well, the name speaks for itself. 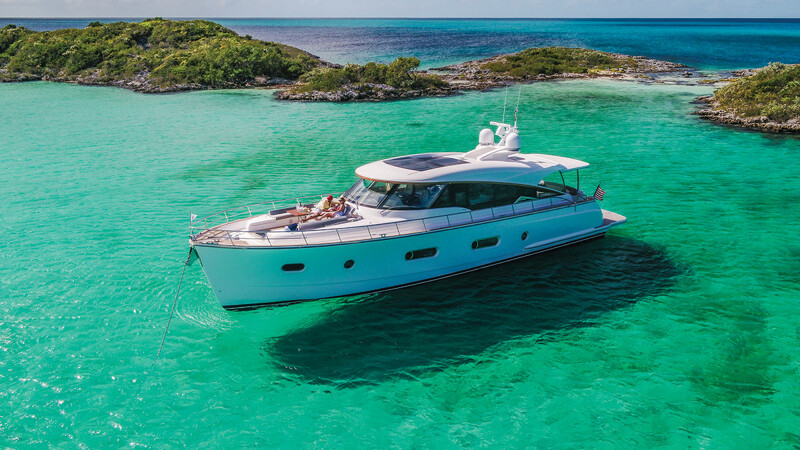 “Beautiful day,” observed Chris McCafferty, Riviera’s international sales director, his lanky frame eased back into the co-pilot’s seat. 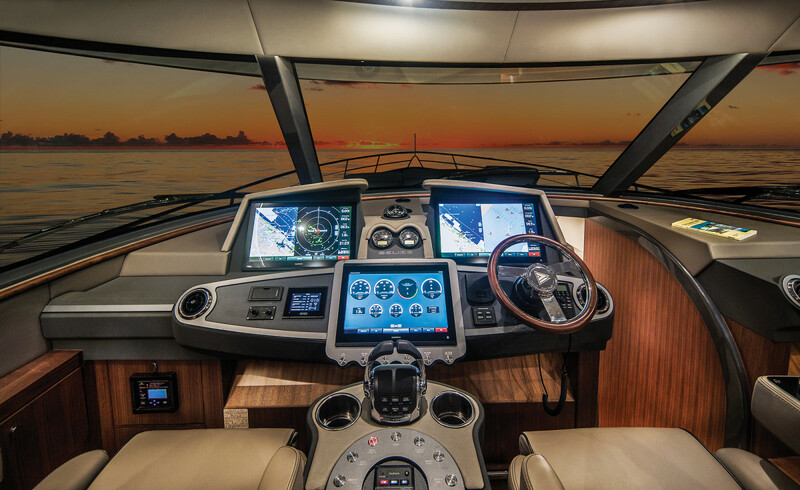 I was fairly eased back myself, steering with the fingers of my right hand via a Volvo Penta joystick mounted in the armrest of the helm chair. 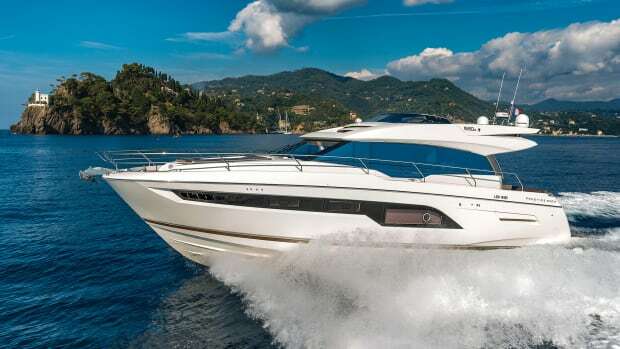 Getting to the binnacle-type engine control, positioned atop an automotive-styled console between the two of us, was easy enough so I leaned forward slightly and bumped our speed up to 20 knots without noticeably disturbing the prevailing quietude. “Yup, beautiful,” I replied, a little preoccupied. We were heading east, into the rollers, with the Bahamas on the nose and Ft. Lauderdale behind, and the 66 was loping along like a super-comfortable, classic limousine. I noticed nary a drop of seawater on the expansive wraparound windshield. The tracking seemed rock-steady and the sense of control I felt was as interesting as it was confidence-inspiring. 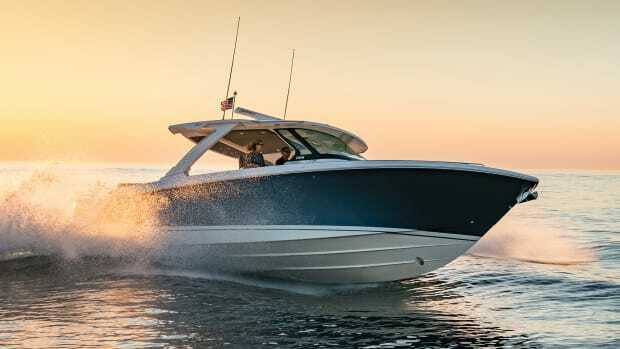 After easing even further back into the cushy helm seat, I fed a quartering turn into Volvo Penta’s IPS-affiliated electric steering system and noted that the boat continued to perform comfortably while making a broad, modestly-heeled turn to the north in big-time side seas. Further impressed, I bumped our speed up to 28 knots. “You Australians know how to build rough-water boats,” I commented, shooting a glance toward McCafferty, a momentary act that revealed a couple of large, express-style vessels off to port, roughly parallel to us. I pointed them out and grinned at McCafferty who immediately grinned back. “Go for it, mate,” he said, as I pulled in a tad closer, thereby signaling my intentions before firewalling the throttles. The helm, with a console between two seats, is distinctly automotive. Earlier in the day, dockside in Ft. Lauderdale, I’d had a chance to get at least a partial handle on why the 66 would later turn in such a rousing performance. For starters, the marketing spiel I received about the hull form had proved helpful. It promised a fine entry forward (with equally fine bow sections), a plumb-ish bow, wide down-turned chines from stem to stern, an effective, deep-V-type transom deadrise (unspecified due to company policy) and a long, substantial keel—all features aligned with dry, effective bee-lining through sporty seas. 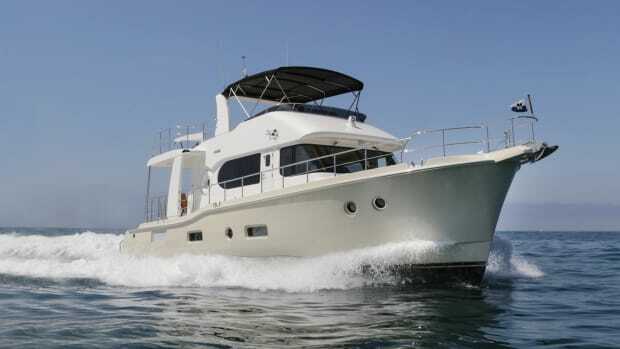 But then there was the hour or so I’d spent on board with Wes Moxey, Riviera CEO and co-founder of Belize. 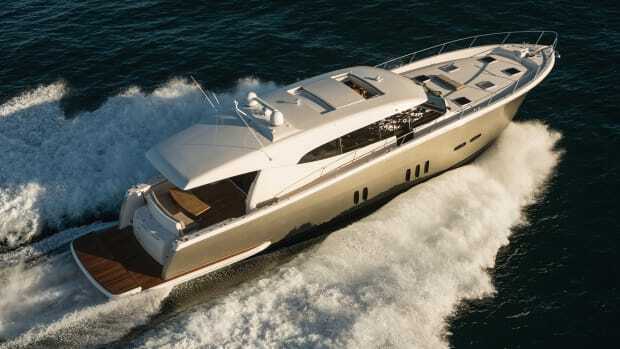 I’d first met Moxey back in the mid-90s when he was spending time at the Wellcraft facility in Sarasota, Florida helping develop a Scarab-type speedboat called the Excalibur 45, a cooperative venture between Riviera and Wellcraft. He was into “hell for stout” boats back then, from what I could remember, and sea-chomping performance. 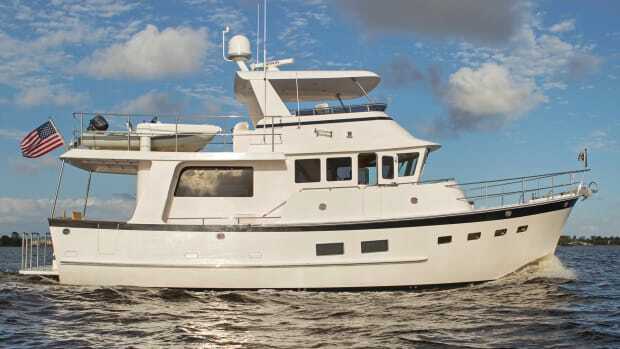 Although this info certainly emphasized Moxey’s continuing commitment to solid boatbuilding, it was the engine configuration we were soon looking at that testified to an enduring dedication to sea-chomping. 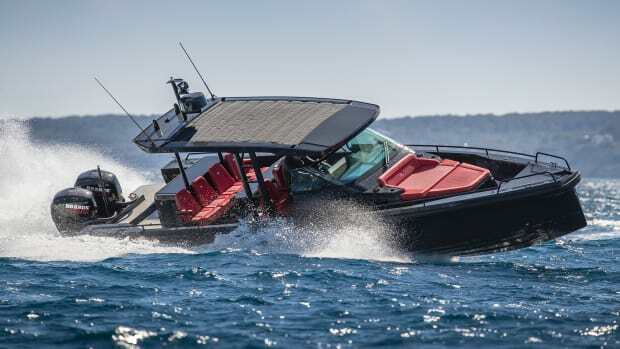 The 1,000-hp Volvo Penta D13 diesels were staggered, raceboat-style. The port engine was mounted well forward, just a couple feet abaft the firewall, and connected to its IPS unit via a long, carefully shrouded steel jackshaft. The one on the starboard side was mounted well aft and close-coupled to its IPS unit. The setup had two advantages, according to Moxey. First, it facilitated a low, centerline-centric weight distribution as well as perfect LCG (Longitudinal Center of Gravity) placement, features that tended to optimize running attitudes, balance and seakeeping stability at speed. 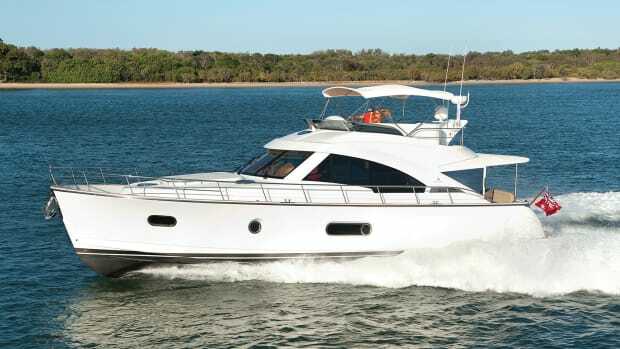 And second, it helped preserve solid access to the mains as well as all the other ancillaries while accommodating the intrusion of the molding for the 66’s tender garage, typically inhabited by an outboard-powered Brig Falcon 330 RIB. My subsequent tour of the 66’s interior also proved enlightening. In general, the configuration of both upper and lower decks was conventional, with a U-shaped galley, a dinette and full-beam helm area in the salon topside and a luxurious, highly finished accommodation space below. Riviera factors a sizable number of modifications into this envelope, however. 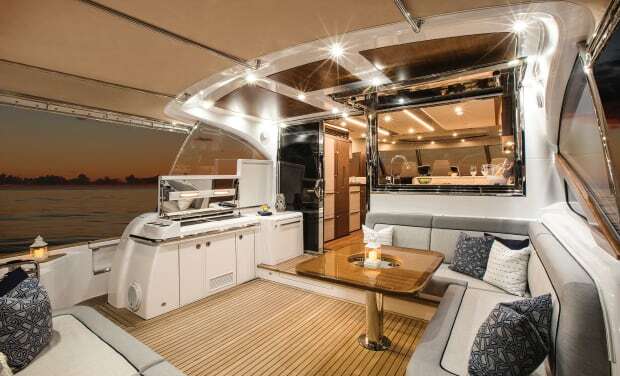 Our test boat, for example, featured a lower deck with the “Grand Presidential” layout, an arrangement that maximizes space and comfort for the owner. 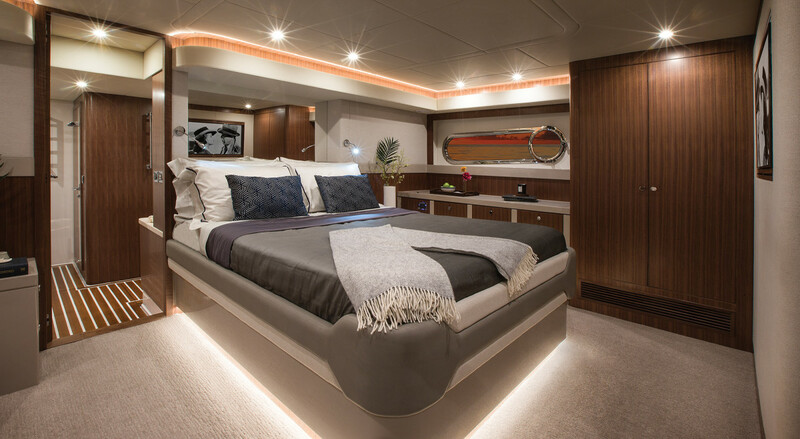 A full-beam amidships master offered a walkaround king-sized berth, two large hanging lockers, an office area, two lounges, a TV on the forward bulkhead and an en suite with a shower stall and twin vanities. Fabric colors were understated, carpeting underfoot was plush and the lockers were fragrantly cedar-lined. Each side window in the master has an opening port. The VIP, all the way forward, was slightly smaller, although it offered virtually the same features, excluding the office area and the lounges. And in between, just to port of a short companionway, I was surprised to see that the small guest room with twin berths (convertible to a single) also had its own en suite. Once we’d finished recording test data on the high seas and I’d had a chance to drive our test boat around to my heart’s content, McCafferty got a call saying he needed to put me ashore at Harbortown Marina in Dania, a substantial Uber ride from where I’d boarded the boat in Ft. Lauderdale proper. 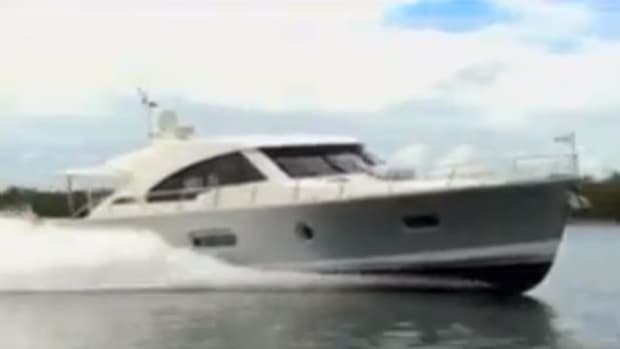 He apologized while coming alongside at Harbortown via one of the Volvo Penta joysticks in the teak-paved cockpit. “Sorry, mate,” he said. The drop-off generated an unexpected opportunity, however. As the boat pulled away, I examined her profile from a distance, something I’d not yet had the opportunity to do. The sight was quite instructive. 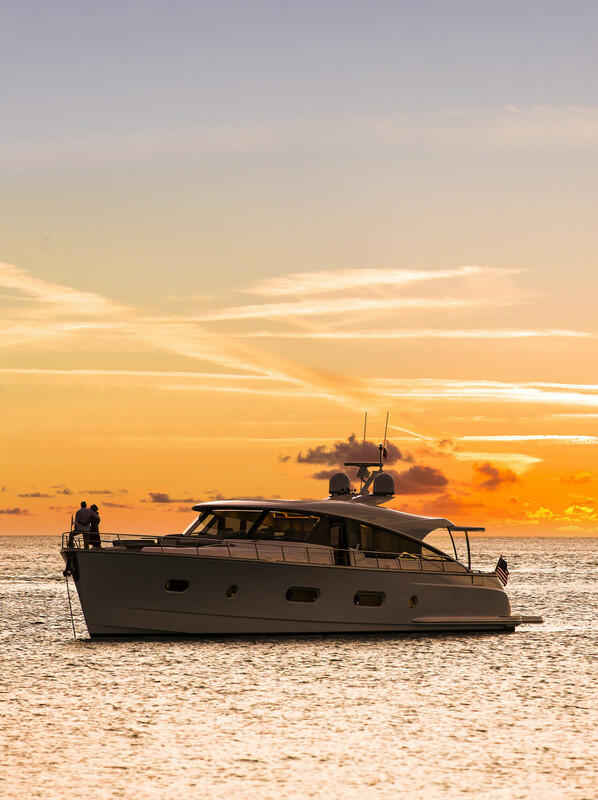 Certainly, in keeping with Moxey’s desire to offer the yachting world something altogether different in terms of styling, the Belize 66 Sedan’s appearance was distinctive. But from my far-off vantage point, I now saw how much the automotive realm had influenced her design. Was she wholly a creature of the sea? Unquestionably. But on the other hand, her lines seemed to be at least loosely aligned with those of modern, low-slung, luxury cars as well. You know, like the Bentley Continental GT and the Audi RS 7. And the effect, I had to admit, was truly low, lithe and eye-catching.